We’re all for tranquil retreats and lazy poolside lounging, but sometimes we prefer to make a splash! That’s when we head for our favorite water slides. But instead of overcrowded water parks, we enjoy the wet ‘n’ wild playgrounds of high-end resorts. 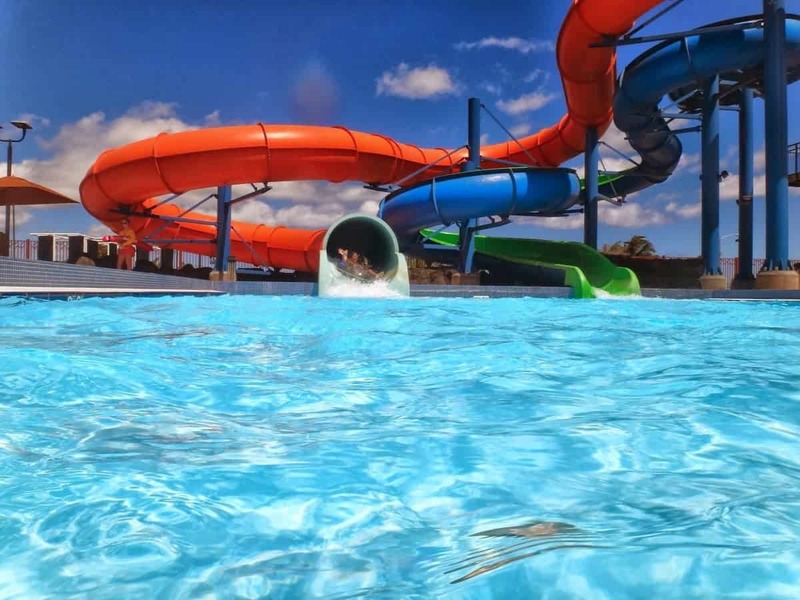 From exhilarating vertical drops and body-twisting tube rides to pulse-pounding slides through shark tanks, our list of best water slides offers unforgettable ways to make waves and have fun in the sun. Lushly landscaped, the Waikolohe Valley water area at this resort boasts two stellar slides. An enclosed extreme body slide, the Volcanic Vertical sends riders barreling into Waikolohe Pool, while Tubestone Curl is an open-air water slide that propels solo or paired riders through a succession of single and double tubes. 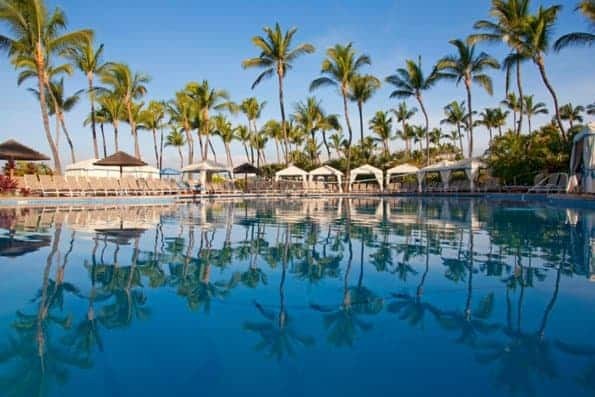 The area also has an infinity pool overlooking Ko Olina Beach, a lazy river, a splash zone for kids and the only private saltwater snorkeling lagoon on Oahu. Incorporated into Puerto Rico’s sprawling El Conquistador Resort, Coqui Water Park is a picturesque maze of water slides overlooking the Caribbean Sea. Thrill-seekers should head straight for the imposing Torre de Yocahu, a 60-foot-tall tower equipped with three high-speed water slides. And if you’re feeling especially brave, there’s El Gigante Dormido, a vertical speed slide with a breathtaking 40-foot drop. The jungle-themed water park also features two massive pools, a rope bridge and La Mina Lazy River, an 800-foot winding loop that meanders through the park. This swanky Four Seasons outpost boasts an upscale five-acre water park dubbed Explorer Island. Along with a lazy river, splash zone and family pool with the Starstruck Dive-In for evening movies, it features The Drop. This pair of 242-foot water slides includes an enclosed slide and a see-through fiberglass slide for watching the world spin by as you race to the bottom. A testament to old-school Vegas extravagance, The Tank at the Golden Nugget belongs on every Sin City bucket list. Part of the hotel pool, this 200,000-gallon aquarium is stocked with stingrays, game fish and six species of sharks, including sand tiger, Pacific blacktip and zebra. Brave guests can slide through the three-story Shark Chute that runs through the aquarium. The see-through tube transports riders through the center of The Tank before depositing them — safely — into the pool. Straight out of a tropical fantasy, the Grand Wailea resort boasts one of the best pool areas on Maui. A water park in its own right, the Wailea Canyon Activity Pool is actually nine distinctive pools on six different levels. 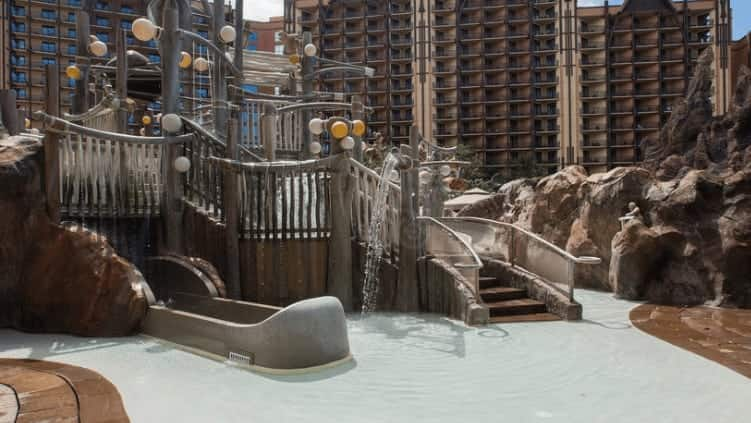 It features interconnected classic slides, a whitewater rapids slide, the world’s first water elevator, a Tarzan pool complete with rope swing and a sandy beach for relaxation between rides. Most notable, though, is The Fishpipe, an exhilarating, 90-second, rotating barrel ride that’s the equivalent of a mile-long water slide. Located at the Hilton Rose Hall Resort & Spa, the Sugar Mill Falls Water Park overlooks the turquoise waters of Jamaica’s Montego Bay. 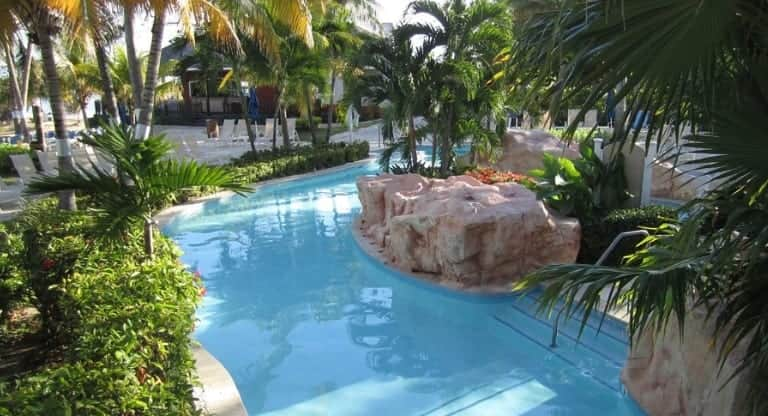 The second largest water park complex in the Caribbean, it is a scenic labyrinth of waterfalls, terraced pools and landscaped lagoons. Most importantly, it has three impressive water slides — including a twisty, 280-foot version. If you prefer a lazier descent, try the smaller slides, which are broken up into three segments, each one splashing down into a different pool. This impressive San Antonio resort is one of Marriott’s largest properties. It’s also home to the River Bluff Water Experience, nine acres of heated pools, waterfalls and water slides. Daredevils should head straight for the 275-foot Acequia Tube Slide for gorgeous views of Texas Hill Country while torpedoing down into the pool. For a unique experience, the Pedernales River Slide simulates natural river rapids, while the 1,100-foot-long lazy river (lined with cypress trees) is the ideal place to unwind. For serious water slide fanatics, all roads lead to Atlantis. The resort’s 141-acre Aquaventure Water Park boasts more than 18 slides, which range from kid-friendly to daredevil. The pièce de résistance, the Leap of Faith slide, drops riders 60 feet down the face of a Mayan-style temple before shooting them into a clear acrylic tunnel through a shark-filled lagoon. Once you’ve regained your composure, head for The Abyss, a 200-foot long body slide that plunges riders into an underground cavern, or The Surge, a combination roller-coaster/river rapids inner tube ride. 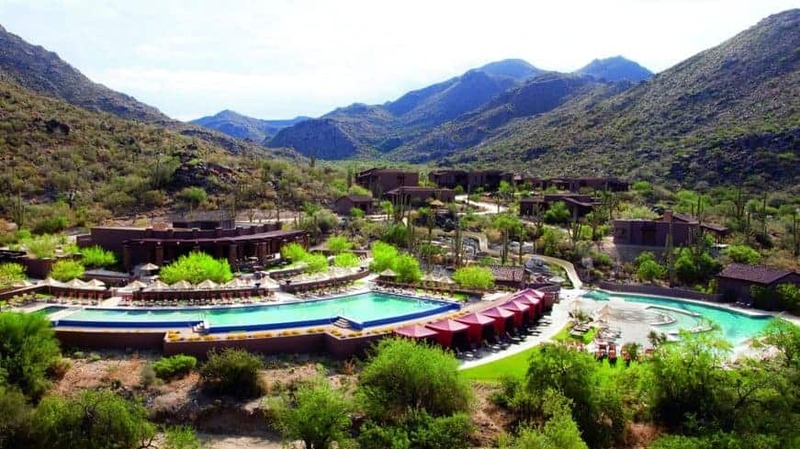 Surrounded by the Tortolita Mountains, the small water park at The Ritz-Carlton, Dove Mountain offers a welcome respite from the heat of Arizona’s Sonoran Desert. Guests can choose from three separate swimming areas, including an infinity pool and a spa pool with a tanning island. Most importantly, the resort offers the 235-foot, kid-friendly Aventura water slide. Parents will appreciate being able to keep an eye on the kids from a private poolside cabana, complete with butler service. Just 30 minutes north of Houston’s city center, The Woodlands Resort is home to the expansive Forest Oasis Waterscape. A great place to escape the baking Texas heat, the park is dominated by an impressive stone tower with a waterfall, a double helix water slide and, once you splash down, an underwater mural. A 1,005-foot lazy river winds throughout the park, and kid-friendly attractions include water basketball and dive-in movies.